Historic. This elegant dining spot resides in the carriage house tucked behind the stately Wentworth Mansion. The beautifully redone building now is an opulent space with French doors that open to velvet booths, a stone fireplace and romantic candlelight. 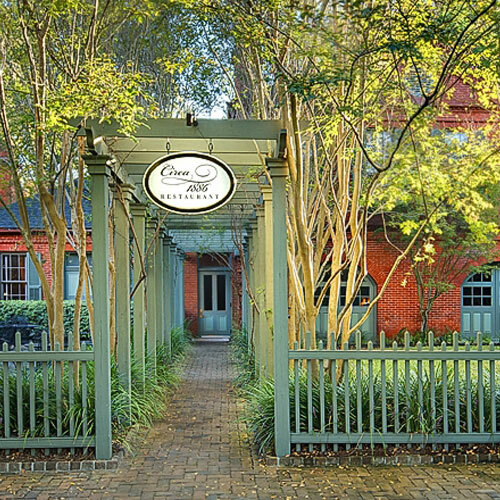 The chef's fine, upscale Southern cuisine changes with the season to incorporate only the freshest ingredients. A representative dish is sea scallops and royal red shrimp with pistachio saffron risotto. Other standouts include duet of lamb and the oregano-marinated antelope loin with chickpea barigoule. End your meal on a heavenly note with the signature pan-fried angel food cake. Fine Dining. Dinner served. Full bar.